Man of Steel may have found Superman's Kryptonian mom. Plus why the Cloud Atlas movie is headed to Berlin! Don Cheadle discusses his future in the Marvel movies. Sookie's various supernatural suitors explain what's ahead on True Blood. Russell T. Davies explains why you must watch Torchwood: Miracle Day, plus Game of Thrones casts its first season two character. 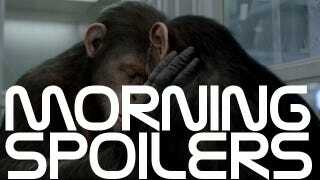 Top image from Rise of the Planet of the Apes. I can't say too much about it, but you've seen the trailers, that's the majority of what we're doing. There's another scene in there that gets into more to the plot points of the movie. [It] was just absolutely amazing to see all of those life sized robots. They're life-sized! Even inside the ship, they're life sized! The work that they do with special effects and building the set is absolutely amazing. It's versatile as a location – Berlin has so many different faces. It can stand in as Moscow or eastern Europe because it retains a lot of Soviet architecture, and it can play big metropoles like Paris or London too. It also has a lot of very modern architecture which is very popular with sci-fi directors, and then you have districts like Kreuzberg which have a very multicultural feel. 1.When death itself comes to a halt, the whole world faces its greatest danger yet. CIA agent Rex Matheson has only one clue - Torchwood. 2. As the Torchwood team is reunited, Jack realizes he's the most vulnerable man on Earth. A flight to the United States turns into a desperate battle for survival. 3. Torchwood goes on the run and finds a new enemy, but as they launch a raid on PhiCorp headquarters, Jack must confront the mysterious Oswald Danes. 4. The fight against PhiCorp takes the Torchwood team to California, where a trap is waiting. Meanwhile, Oswald and Jilly find themselves with an enemy of their own. 5. Torchwood goes undercover and discovers the terrible truth behind the Miracle. The enemy is closing in, and death is about to make a shocking return. 6. With Gwen, Rex and Esther trapped on both sides of the Atlantic, it's a race against time as Jack goes straight to the heart of the conspiracy. 7. Gwen must fight to protect her family and takes a terrifying journey, covering both miles and decades, as the long history of the Miracle is revealed. It's a great big rollicking adventure, which Torchwood always is. But the stuff it has to say about society in the West is very true, I think, and very dark. And when you look at a world that nearly collapsed in 2008 due to a financial crisis, this takes it a step further, and sees where we end up. We really tell the story on a big scale, by the way. It seems very domestic and small to begin with, but it grows and grows and grows. The whole of Western society and beyond is changing. So, if you want that size of journey, if you want to come on an imaginative ride that has so much nerve, then come and join it. It's enormously well told. "Bachelorhood kind of turns out all right for Bill. I think he decided to enjoy it while he can. A lot of responsibility smoothing over the Russell Eddington nightmare. He's trying to make vampires attractive to humans again, by sort of doing press, without giving too much away. [Regarding Sookie] He makes the decision that if you're going to love somebody, set them free, and the only way to allow that there might possibly be some rekindling down the line is to let her be the person that she needs to be without making her feel like he's watching her every move." "Alcide's situation is a lot more complicated romantically when you see him first in episode 3. I don't think he's had a change of heart so much as much as he wished things could be a little different. There's some certain substantial things that the fans will find out in those first few episodes. Had [Sookie] responded differently, I think he would have built that house for her. Alcide is a recluse. He just wants to be left alone. He hates being a werewolf. He hates that he was cursed – he sees it as a curse. The great thing about Sookie is she drags him out on all these adventures. This little thing drags him out of the house. Really, I think she's the key to unlocking that reluctant hero inside of him and I think he recognizes that's a good thing." "It's fair to say that the first six episodes were teeing up a lot of conflicts that will be more fully explored in our second season. We find a growing conflict with our two main guys, Rick (Andrew Lincoln) and Shane (Jon Bernthal). We're really excited about putting all of the characters on a chessboard and seeing how wonderfully and effectively we can toss conflict into the game." "I like where writers have taken my character. They've been feeding me, making me more human along the way. They've given me a bit more, as a person, more stuff to do. Just like Fargo in that sense...We embark on our most ambitious project to date. The town works together toward a common goal and it's informed by what happens in the first episode back. You get more into the characters, but we balance that with action and fun. There are a lot of explosions, people flying around, lots crazy things. You know, the normal Eureka. It's a really solid season."